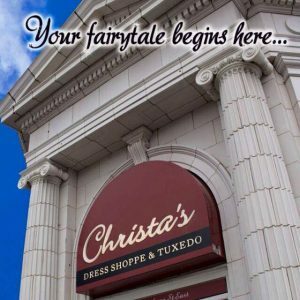 3 Ways to get Free Stuff at Christa’s! Home » Blog » 3 Ways to get Free Stuff at Christa’s! 1. Sign up for our Text Program! If you text PROM2K17 to 57711 not only will you get updates every time there are amazing deals at Christa’s, but you will also be entered into a drawing to win a $25 Gift Certificate to Christa’s! (Be sure to reply YES to the text you get from Christa’s to complete your registration or it won’t officially count!). 2. Watch for drawings on our Facebook Page! Christa’s does regular drawings for Free Shoes, Free Jewelry, a Free Wedding Gown Preservation, and Gift Certificates! Make sure you like our Facebook Page and click “Follow” to stay up to date on what drawings are going on. Some days we feel like doing one for absolutely no reason, so stay tuned! 3. Review us online! Christa’s does Review Drawings at least four times a year. That means once every three months you have the opportunity to win a Free Wedding Gown Preservation, a Gift Certificate to Christa’s (sometimes it’s a $100 Gift Certificate! ), or other fabulous things! We put you into the drawing once for EACH review you do! So if you review us on Theknot.com, Weddingwire.com, our Facebook Page, Google Reviews, and Yelp.com you could be entered 5 times! (We post a complete list of all of the sites you can review us on two to three weeks before each drawing).